In her usual style, Amanda Muggleton engages the audience as soon as she walks on the stage. This time, she takes on the challenging role of morphing into Maria Callas in the latest MTC Production of Masterclass. It is hard to recognise Muggleton: we watch an eccentric woman, carry herself across the stage with long dark curls. Her is hair drawn back and tied with a large bow and heavy, sharp makeup is painted over her face. She intimidates just by walking and is immediately frustrated even before the class begins: the lighting is wrong, there is no footstool, and no cushion for her to sit on. We, the audience are her class. She walks past us authoritatively and gives advice to one audience member, "I am sure you are lovely, but you don't have a look. You have to have a look!" For all the abuse she throws there is a balance of humour. " I won't hear anything said against my colleagues," Callas states, "Joan Sutherland did her best." This is not the first time Muggleton takes on the complex role of Callas. In 2002, she won her Helpmann award for playing Maria Callas in Terrance McNally's Masterclass. Muggleton understands Callas well and, as a result, the audience gets a glimpse into her essence. Throughout the play, we see three individual opera students come to her masterclass to get instruction. Callas passes her wisdom to her students with both passion and insult. During her tuition, she is drawn to her past. Whilst the class is taking place, we see images of a young Callas and we hear Callas' powerful voice. For a moment, the students fade into insignificance. We see Callas' flashbacks of her unfulfilled marriage and her relationship with her mother. She relieves her tempestuous affair with Aristotle Onassis, remembering specific conversations. It is unnerving to watch how she transforms into the tycoon, Aristotle Onassis, as they are having a dialogue. She catches herself reliving her past and often brings herself to the present by saying "but that's another story". 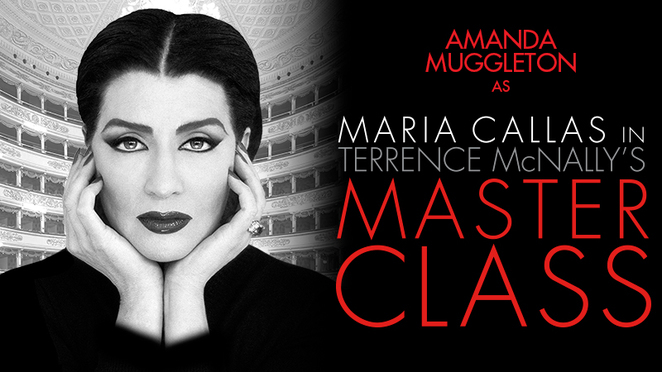 Muggleton personifies Maria Callas as a demanding, volatile diva, and a powerful figure in the world of opera. The opening night of Masterclass in Melbourne is complete with a grateful audience and a well-deserved standing ovation.